Contains a Precision pt100 Ω DIN Platinum Thin Film Element in Either Class A or Class B Accuracies. This pt100 RTD sensor probe is designed to provide the ultimate in adaptability. Its 24" length can be reduced in the field by cutting off the required tube length using a standard tube cutter. 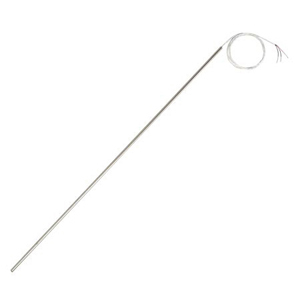 Combining the PRCTL sensor with Omega's wide variety of fittings and accessories can customize this sensor on the spot for a wide variety of RTD replacement probe or OEM RTD sensor probe applications. This sensor is available in both Class A and Class B accuracies, in 3 wire standard (4-wire optional) in 1/4" diameter to fit many thermowells, or in 3/16", 6mm and 4.5mm diameters. Standard Options:For sheath lengths greater than 24" change model number to length desired and add $1 per inch to the price. For wire lengths greater than 40", change model number to length desired and add $1 per foot to the price. Metric Options: For sheath lengths greater than 600mm change model number to length desired and add $1 per 25mm to the price. For wire lengths greater than 1 meter, change model number to length desired and add $3 per meter to the price. All:For 4 wire configuration change “2” to “3” in the model number.